The cherished holiday season when we like to take a moment to reflect on all that we are grateful for this year. 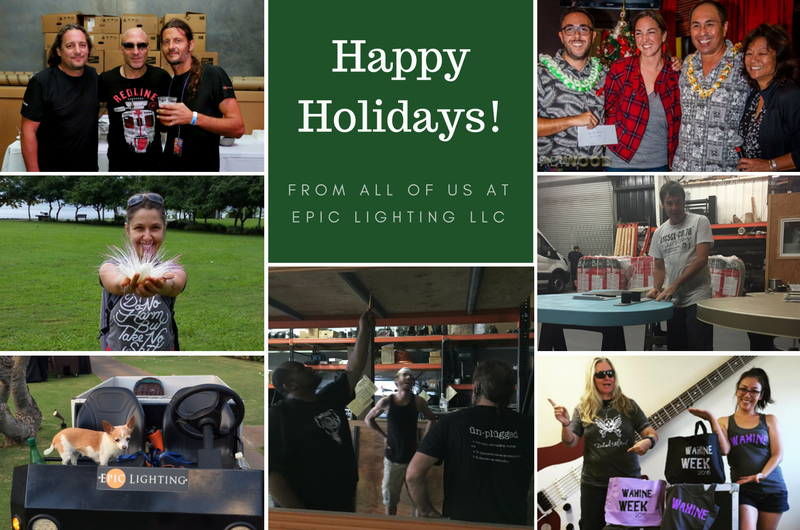 Following Epic Lighting LLC tradition, we want to pass that gratitude along to our clients, and especially to our home base community of Maui. We want to make sure you all know how much we appreciate you inviting us to light up your life! As your one and only green-business-certified, all wireless, battery-operated, ambient event and stage lighting company, we are honored to provide the professional services to help celebrate your special day, impress your audience, amp up your fans, and showcase your worthy cause. 2016 has been a great year for all this and more! With just a few days left in the year, may we all take the time to remember the blessings in our lives. For our part, we are grateful for the extraordinary team we work with, and for the beautiful island community we continue to serve. Photo Collage Captions: [top left] Keith Langlois, CEO/Lighting Designer (L) and Benjamin Alvarez, Master Set Builder (R) with Kenny Aronoff at Wahine Music Festival; [middle left] Bookkeeper Dina M.; [bottom left] The Mighty Mochi-Khan, Company Mascot; [bottom center] Lead Lighting Tech Kaleo J. (L), Lighting Tech Max K. (C) with Keith at the Epic Lighting LLC Warehouse; [top right] Administrative Manager/Corporate Client Liaison Aleta Lee (R) and Social Media Manager Jen Cox (2nd L) with MAF’s Anthony Acosta (L) and World AIDS Day contest winner Keoni Wats (2nd R), photo by Adiwood Studios; [middle right] Shop Tech Murray H.; [bottom right] Non-Profit & Community Client Liaison Jessica-Lynn Nakasone-Koki (R) with Caron Barrett from The Deborah Vial Band. We look forward to another full year of celebrations and events on Maui and beyond…but we gotta say, we are also stoked for the new adventures taking shape within our local event design world! We can’t wait to show you what’s in store for 2017, but you’ll have to stay tuned for news updates as plans come to fruition in the coming months…keeping your eye on this blog, as well as on our Facebook and Instagram, is just the way to do it! 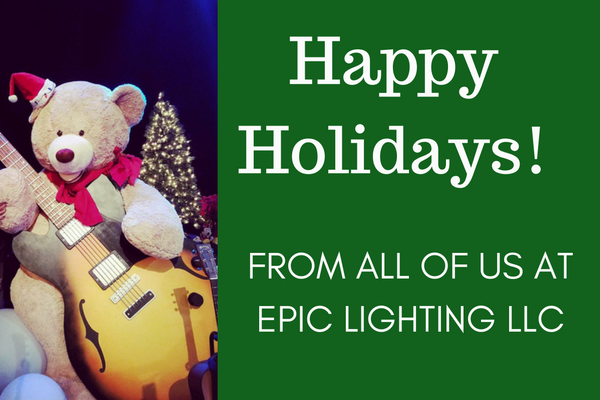 For now, let us leave you with this: may your New Year be filled with happiness and prosperity; and again, mahalo for your patronage from all of us at Epic Lighting LLC.